So what if we're in the cold seasons? 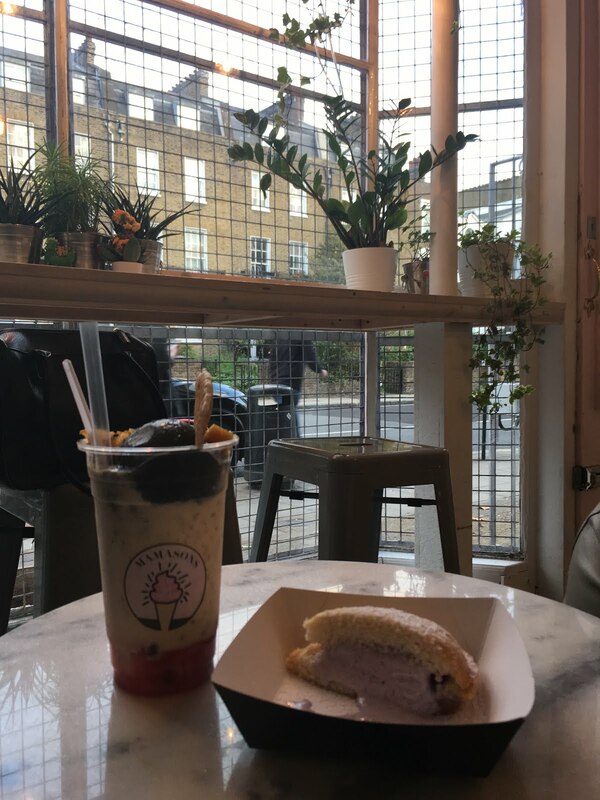 Filipino Ice-Cream just hit London and I'm definitely going to take advantage of this place whatever the weather! 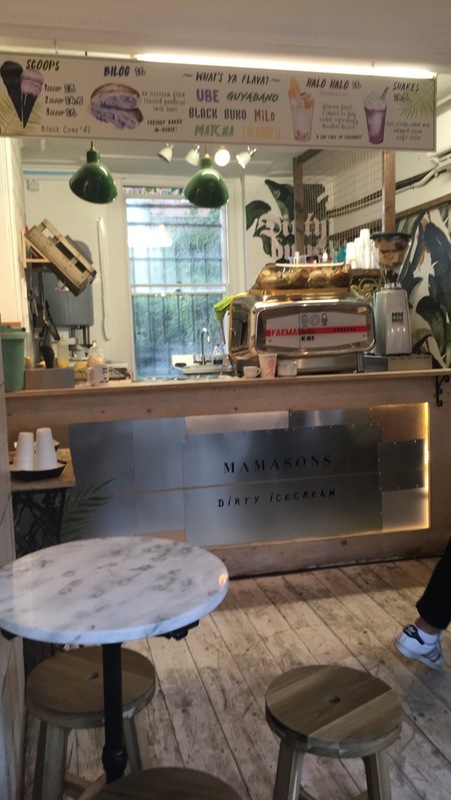 Mamason's Dirty Ice Cream opened this summer and boy, am I ecstatic! 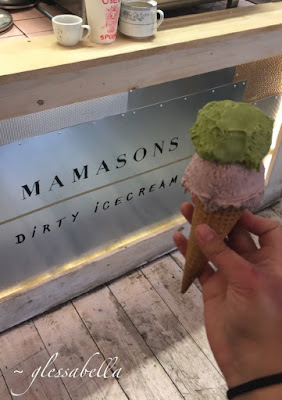 Don't know what dirty ice cream is? Well, first, it's not actually dirty... not here anyway. Dirty ice cream refers to the ice cream served on the streets in Philippines. You'll find these vendors around anywhere and their bound to be serving different variations of ice-cream, from ube, to queso (cheese! ), and the classic chocolate flavour. What makes this ice-cream so special is the hard-work that goes into making it. No fancy machinery or expensive imported ingredients, but instead you're served the native, raw experience of ice cream that's been created by hand with ice and natural local ingredients unique to the Philippines. And now it's in London! 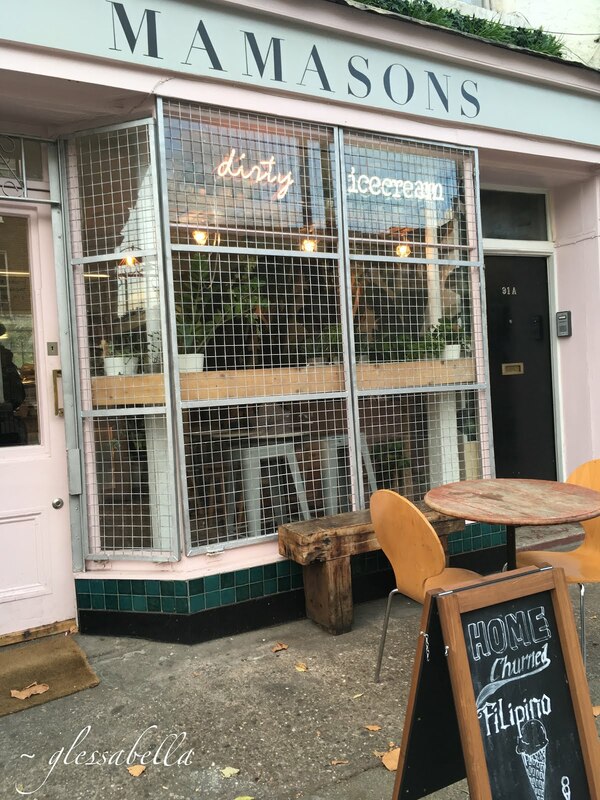 You're greeted with a quaint and pretty looking exterior, perfectly Instagramable with it's contemporary fonts, urban caged windows, with pops of exotic looking plants on the windowsills. 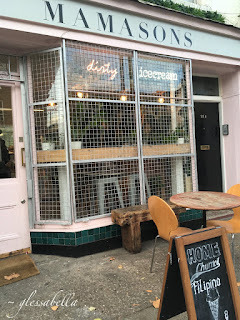 Despite how lovely and simple the designs are, I felt strange that I was about to have dirty ice cream in the cosy indoors rather than outside from a street vendor - after all that's why it's called "dirty" ice cream. I hoped it wouldn't lessen the enjoyment of the experience, and I'm glad to say I was actually quite impressed. Any Filipino would be over the moon to see the range of flavours available! They not only have our favourite native fruits - guyabano, calamansi, buko and ube - but they also serve every Filipino child's favourite heartwarming beverage - Milo! Oh the joys of dirty ice cream. I honestly recommend you try all of the flavours, but if I had to pick a favourite, it would be black buko... oh, actually, maybe Milo... or guyabano... AHHH! Just try them all! If that wasn't enough, they even put a filipino twist on a classic ice cream sandwich. They call it bilog, a sweet milk bread called pandesal is halved, filled with any flavour of ice cream of your choosing, then toasted and dusted with confectioner's sugar. This is my favourite treat there since I LOVE pandesal! Fancy something even more exotic? A Filipino dessert cafe wouldn't be complete without serving a family favourite - halo halo. One scoop of ice cream, jelly, sweet beans, fruits, leche flan, all in one cup with milk, condensed milk and crushed ice! I admit that this dessert isn't for everybody, but it's most definitely worth a try. Remember to mix everything together - it's called halo halo for a reason! 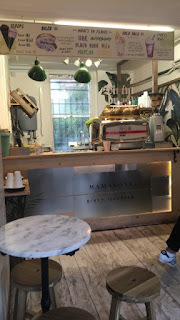 All is well when you see that all the treats they have to offer are crazy yummy, but what really impressed me about Mamason's was the pride that's put into serving. Just like you'll see on the streets of Philippines, they scoop and serve the delicious ice cream up from these long metal cylinders. Something so simple like this makes such a difference because it enhances the authenticity of the experience. Not only that, but they even display a vintage ice cream maker that was used by the owner's relatives themselves. 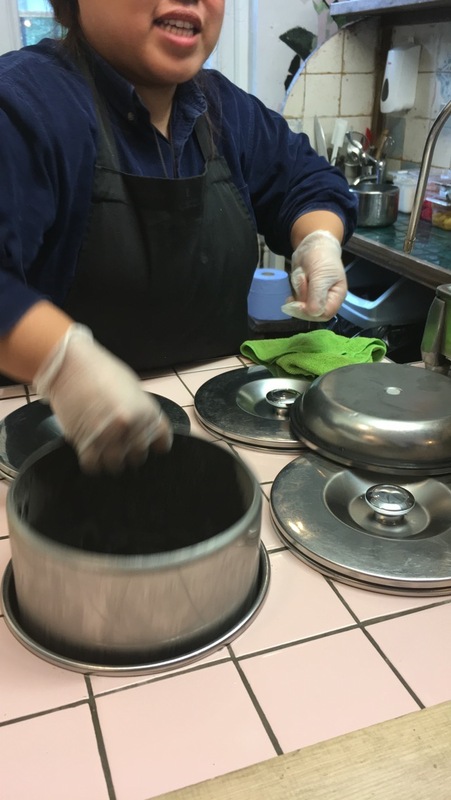 Even though they don't make the dirty ice cream the native Filipino way, the attention to detail and knowledge of the traditions are enough to compensate for it. If you want to know a little bit more about the process, just ask the friendly staff. 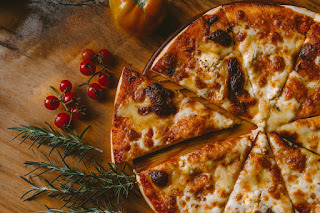 Mamason's offers something new to London's food scene and if you're willing to give exotic new flavours a good try, it's the perfect place to go after a meal out with friends. Based in Camden Town, I recommend going after a trip to the Kerb Food Market there - you might as well make it a world food tasting day! 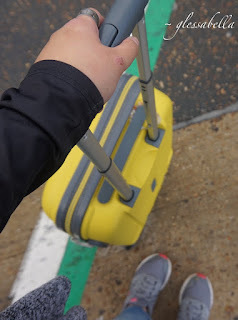 Thank you for reading this blog post. I need to go wipe off some drool now.